I woke to a raging thunderstorm which started over Tanga (1 mile for 1 second, I still remember from my youth) and gradually came closer until it moved inland. The only trouble is that I am used to a storm clearing the air and leaving it fresh but no chance of that here. The thunder went, the rain stopped and the heat and humidity immediately returned. Thankfully the storm had abated before I mounted my bike for the much chronicled journey to school, but when I reached my shop for my daily bottle of ‘maji baridi kumbwa’ the keep fit brigade from Boza elementary started passing by. I’m standing their gently perspiring (Yes. As if.) 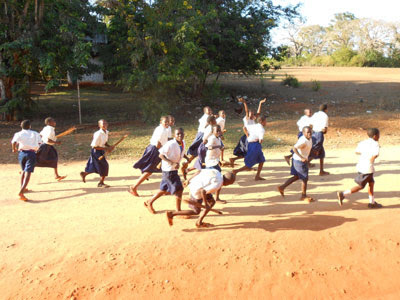 and suddenly groups of about twenty children start running out of the village, past the entrance to the secondary school, past the shop, before turning back into the village. They are all chanting the Swahili equivalent of “I don’t know but I’ve been told…..” like a group of US army draftees, and as soon as one group disappears the next one turns onto the road. I did try to photograph them once, earlier in my visit, but they dissolved into laughter and scattered in all directions so this time I took the photo practically facing the counter of the shop. Perhaps they too believe, like the women who cleaned the YMCA for the opening of the hall, that ‘muzungus’ take photographs to take back to the west and sell, presumably to ‘National Geographical’. I arrived at school and finished my reports, handed the marked papers back to the students before flattening the battery on both laptops trying to do some work. Last night the electricity was so poor it wouldn’t even ‘spark up’ the long life bulbs in my room and I had to rely on an orange glow from the old filament style bulb in the bathroom. By ten o’clock it had given up completely and then stayed off for the next twenty hours. I had shown Mr Masui a sheet with all the various details needed for the reports and my comments ready to copy on, so when he asked me to follow him into his office I wondered what gaff I had committed. In fact he wanted to ask if I would join him, and his wife, for breakfast the next day. As I normally get to school for 7:30 am, I wondered what time I would have to set off now, but I needn’t have worried, the invitation was for 10:00 am. For some reason I had failed to ‘pick up on’ the fact that the break in lessons from 10:40 until 11:10 is for breakfast, not the mid-morning snack that it is for me. I accepted the invitation and made a mental note to make sure I had my best bib and tucker on tomorrow morning. 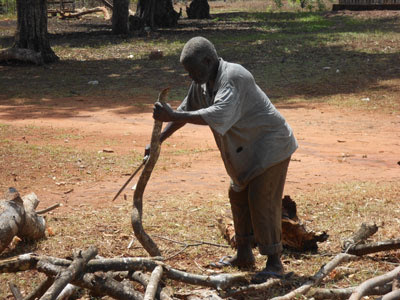 Talking about food; you’ve already seen the lady who normally prepares my chapatti at break but I haven’t yet shown you a picture of the main cook, who can be seen below chopping some wood for the cooking stove. Thankfully the students eat after I have left at 2:40pm. My goodbyes started today at the YMCA. Eva left this afternoon for her month’s annual leave so I will be gone by the time she returns. One of the YMCA pick-ups had come down to do a job and was returning to Moshi, so she took the opportunity of a lift and Deo also jumped on board for a chance to see his wife and children for a couple of days before returning on Sunday. I used MS Publisher to make a thank you card for her with a picture of the pair of us on the front and it was very gratifying to see that she seemed even more pleased about the card than the offering inside. 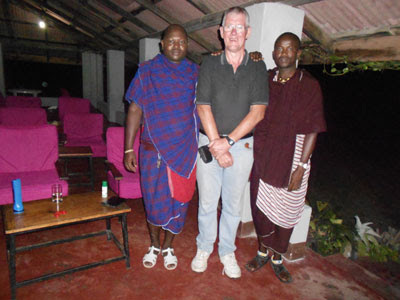 Two of the Masai guards from next door came round in the evening and as they were not likely to be doing the Masai leap I risked having a photo taken between them. John is on my right and Melale on my left. They are both real characters and delight in encouraging me to attempt conversations in Swahili, nodding and saying ‘ndyo’ (yes), every time I actually say a sentence that makes sense. I still have to tactfully find my bottle of water and pretend that it is the best drink in the world, whenever they offer me a beer though. They are very generous, but I now know the cost of this generosity so as long as I don’t offend them I am quite willing to do a little ‘ducking and diving’.